Open Access is all about removing pay barriers and publisher control to make the research output of universities and other institutions available to everyone in order to maximise its impact and its usefulness to everyone. Open Science is now an international movement that opens up enormous opportunities for collaboration, transparency and innovation, and which ultimately increases the positive impact of research on society. 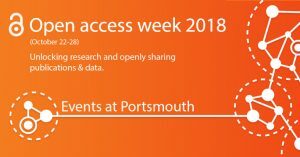 The Library Research Outputs Team are helping run drop-in events in faculties across campus to help raise awareness of Open Access and its benefits all next week. Read more and find your nearest Faculty drop-in event here.